of my favorites is working for special people and wonderful groups. I recently volunteered for the Jewish Family Services of Colorado and their residences at the JFS Group Home. It was just a casual deal with a couple of dozen folks. But the best part was working with the residents — awesome adults with special needs. By the looks on their faces they had a good time. But I’m certain that I got the better deal. I was the one who felt great that night. I was the one who laughed the hardest. And I was the one who left thinking it might have been the best show in ages. want to feel good, make others feel good. To be honest, this is a lesson I often forget. But those great people made my day. Thanks Kids. It was an absolute pleasure. Hey! 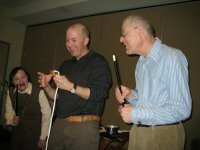 Are YOU looking for a magician, speaker, comedian for your group? (I need a better job title!) I’d love to be your guy…. go to the contact page now. Brad as a magician? Click here. 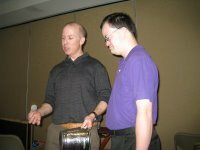 Brad as a magician speaker here. awesome folks in South Dakota recently doing my Laugh-O-Nomics program. Part of this program is motivational humor, but a huge part of it is facilitating a discussion about what specifically they can do to incorporate and implement the ideas we come up with that day. In other words, motivation is nice, but action is better. This group came up with a killer idea: Vent Tickets. 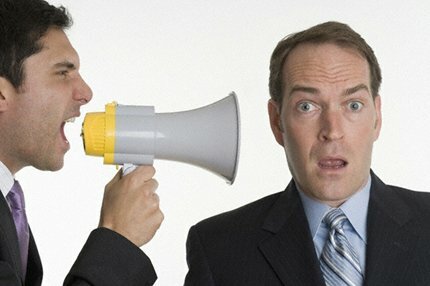 The problem they — and most offices — have is that often whiners and complainers get way too much attention and end up sucking up way too much energy. Sometime the complaints are valid. Often they are just a bunch of hot air. What to do? The PURPOSE of this ticket is to release negativity in the work place! You will receive 5 tickets per week and you may use it at any time, with any co-worker, including your supervisor. You will then have 10 minutes of the recipients undivided attention to let out all frustration, whining, and complaining. Once you have redeemed your ticket, the issue will no longer be discussed with the same or different co-workers and the negativity will be gone!!! We are starting out with 5 tickets per person a week and will gradually decrease the amount of tickets each person gets per week. We are very excited about this new process and hopefully it will decrease some of the negativity in the office, which tends to happen when you have 7 women working in one small space. 1. It is a positive way to deal with negative people. 3. They know that it will take a while to work… and that a successful adoption of this concept into their work culture will take a while. It won’t happen overnight. But if they continue to push, eventually it will be a ritual and tradition that their folks will not allow them to drop. I love the fact that you can look one of your co-workers in the eye as they launch into some complaining or whining or just plain being negative and say, “Oh, let me interrupt. I’ll need to see your ticket before you go on.” It is a fun and funny way to gently remind your peers that they are bringing you down. I love that the very existance of the tickets will lessen the need for the tickets at all. And I love that this awesome group not only had a great idea, they acted on it. I’m impressed. and I’m thrilled. Does your organization need some humor in the workplace strategies? Think a visit from a humorist motivational speaker is your ticket? Contact me here. Does your group need to find and create strategies for humor in your workplace? Think a really motivational speaker is your ticket? Contact me here. Please comment and help me (us!) understand how you would use this idea. Let me know what you think and if you have any other ideas or thoughts!